Re : Portraits 1-3 . A boy and girl from each class is depicted. The face shapes /clothes and characteristics are based exactly on the actual drawings from the pupils. 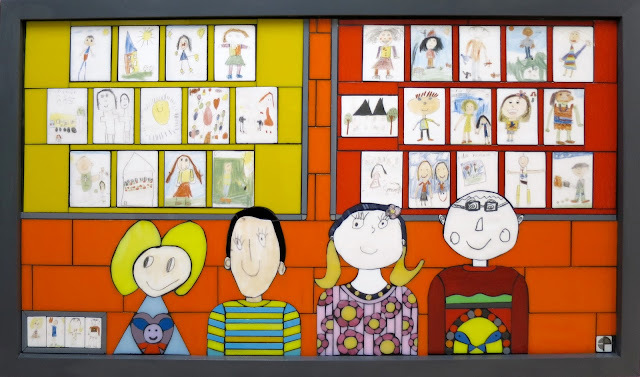 The pupils are depicted standing in front of notice boards that display the pupils original artwork that I have scaled down and made into permanent glass tile decals Each notice board represents a class . The pupils artworks that I’ve depicted show their drawings that represent, how they see themselves, what they love, where they live and what they do in school. Portrait 1 : Junior and Senior infants . This portrait references the parents and grand-parents of the school and includes their ‘words of wisdom’ and advice . The Portrait is displayed at ‘child’ level. I have depicted 6 parents /grandparents, each has a mirror face so that the observer can be the reflection and they can see themselves as an adult with adult characteristics. The speech bubbles contain a selection of the answers to the 6 questions that were posed to the parents and grand parents in an interview by the pupils. 1: What was school like when you were young ? 2 :What is the most important thing you ever learnt in school ? 3: What do you remember most about school ? 4:What is the most important lesson life has taught you ? 5 :What was the best advice you ever got ? 6 : What advice would you give to your child now ?